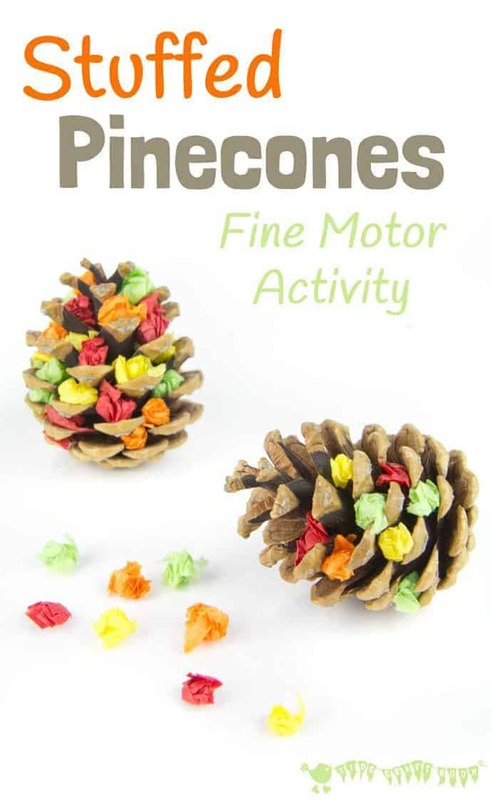 Pine cones lend themselves to so many great craft and play ideas for children of all ages. You can see all of our fun nature inspired crafts here. Today I’m excited to show you our Autumn Tree Stuffed Pine Cone Craft. This pine cone craft is so simple as it simply involves tearing up little pieces of tissue paper , scrunching them into little balls and popping them into the gaps in your pine cones. 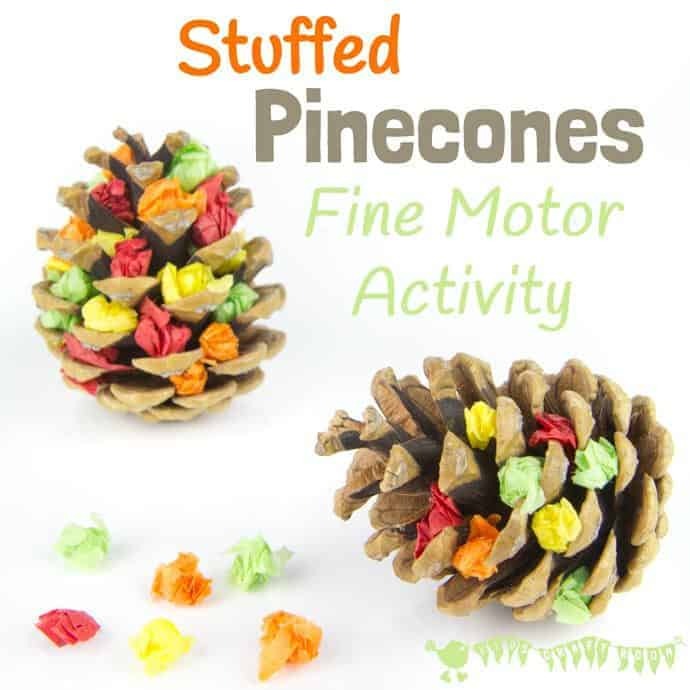 This is a fantastic fine motor skill activity for little ones. Using tissue paper that tears so easily means that even very young children can succeed with this craft largely on their own. I love that this pine cone craft actually gets the children outside collecting their own craft materials and really encourages them look at the changing colours around them at this pretty time of year. 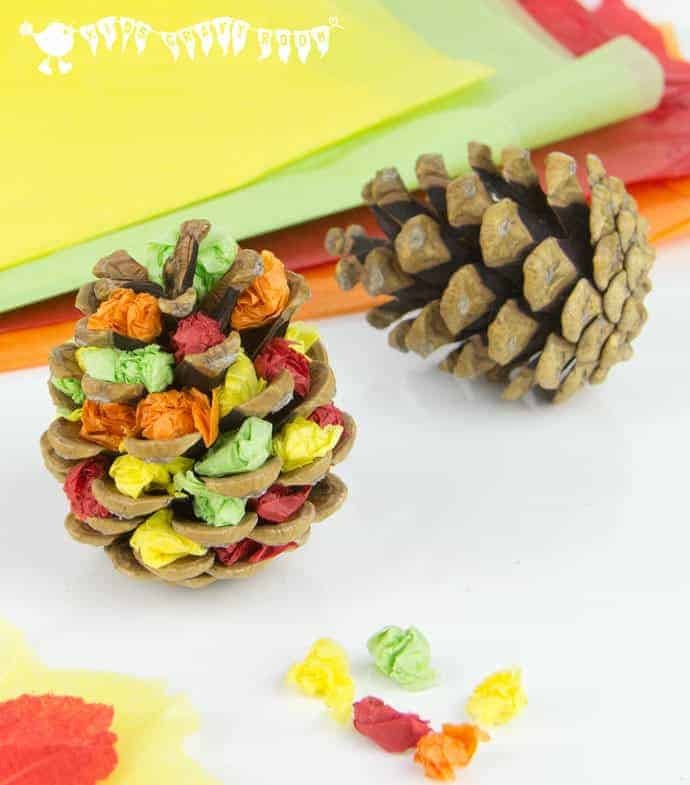 Of course you could use this pine cone craft idea all year round with different coloured tissue paper or additions. Spring – children might see light greens, whites, pinks and purples on the trees outside. Summer – lots of vibrant greens and maybe some butterflies to add on. Autumn – brings lots of gorgeous yellows, reds, browns and oranges. Winter – might see some ice and snow. Maybe white tissue paper or cotton wool. And what about the addition of some ‘frosty’ glitter. 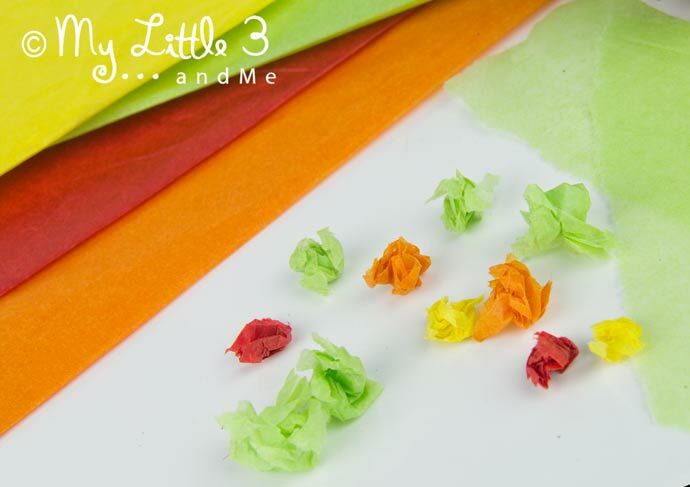 We love these tissue paper sets from Amazon, great value and a good range of colours. Why not make lots of pine cone trees and hang them together to make a pretty mobile! Use a glue gun to attach the pine cone tree to a sturdy stick for a trunk. These look really pretty standing in a little plant pot and make a lovely Autumn table centrepiece. Thread one to some wool to make a pretty Autumn necklace. 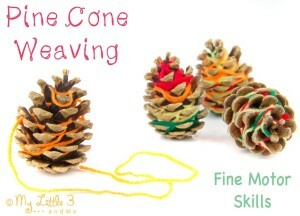 Want To Make a Game Out Of Your Autumn Tree Pine Cone Craft? Why not blow, blow, blow your Autumn trees and see how many leaves you can blow off. A great game for building those mouth muscles and extending the breath. We have another Autumn Blowing Game you might like to see here too. Have fun counting out how many tissue paper leaves each person blew off. Colour sort the leaves into piles. What Else Can You Do With Pine Cones? They are lovely and light and easy to grip so use them for gross motor skill development with rolling, throwing, catching, kicking and spinning. Pop them in your treasure baskets. They have a fantastic texture that little ones will love to hold and explore. Add pine cones to water play. Children will love watching them float, bob and spin and of course they close up when they’re wet too so there are lots of super science and weather chatter opportunities there! Don’t just save them for outside water play, why not put some in your bath time play basket too? They’re marvellous for maths fun and can be used for counting, weighing, sorting and sharing. Last Autumn we were delighted to be invited to share one of our pine cone crafts with Cerys at Rainy Day Mum. You can see our fun Pine Cone Weaving Activity there and of course lots of amazing activities and crafts for kids from Cerys herself. Here’s lots of Autumn themed goodies for children. I hope you have lots of fun with this Autumn craft project! You can see all our other Nature Inspired Arts and Crafts here. Love how simple this pinecone craft is for children of all ages! Let them look back at this creation as well as all the others, with Keepy. 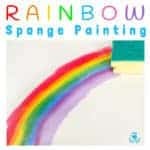 It’s an easy to use app where you can organize and privately share all of your children’s artwork. They can even add video commentary describing their unique piney masterpieces! Hoorah! Something to do with all the pine cones my 3 year old insists on bringing home! What a wonderfully simple but so effective idea! Aw that’s just so pretty and super simple to make too! What a wonderful idea, they would make perfect table decorations.